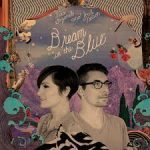 Since 2002, vocalist Sara Gazarek and pianist Josh Nelson have nurtured an uncommonly strong musical bond. It’s no mere happenstance that Nelson played as a band member on all four of Gazarek’s albums, and she, in turn, sang on two of Nelson’s own recording projects. But over the past 18 months, this Los Angeles-based pair has taken their collaboration to a new level, touring extensively as a duo and developing a diverse repertoire that showcases their combined artistic maturation. Gazarek and Nelson recorded their new album Dream in the Blue (funded exclusively through the crowd-sourcing website pledgemusic.com) as a tribute to their extraordinary partnership. The clarity and warmth of Dream in the Blue, captured vividly by veteran producer and engineer Al Schmitt (who has worked with legends such as Frank Sinatra, Sam Cooke, and Bob Dylan), contributes to the emotional arc of Gazarek and Nelson’s program. The album opens with a medley that joins the Beatles’ “Blackbird” with the standard “Bye Bye Blackbird” — an arrangement that first appeared on Gazarek’s debut album, Yours. “‘Blackbird’ is one of our signature arrangements,” states Gazarek, “and when Josh plays his piano intro at the top, fans immediately recognize it, so it made sense to revisit and celebrate it, and highlight how it’s grown over the years.” Another medley closes the album: Nick Drake’s “Cello Song” morphs into the standard “Without a Song,” again highlighting a link between the Great American Songbook and the world of contemporary music. Over the years, Gazarek and Nelson have learned “to breathe together and anticipate where we’ll go, but react with joy and flexibility when we find each other in new terrain,” Gazarek says. “There’s so much freedom in the trust that we share — I know at any given moment, Josh will push me but also support me in a way I can’t imagine experiencing with anyone else.” Those inspired moments of finely honed communication between Gazarek and Nelson pervade Dream in the Blue, an album that exemplifies the art of the duo at its best.